There are nested rolls happening here as you can probably tell. So. Anyway. Mostly a computer question I guess. What do you think? Hey New Mexicans! I’m planning this trip now. Are there good reasons to get there early/late or should I just plan on getting in Thursday and leaving Sunday night/Monday morning? Is there an afterparty scene or does everyone run off to their jobs and responsibilities? 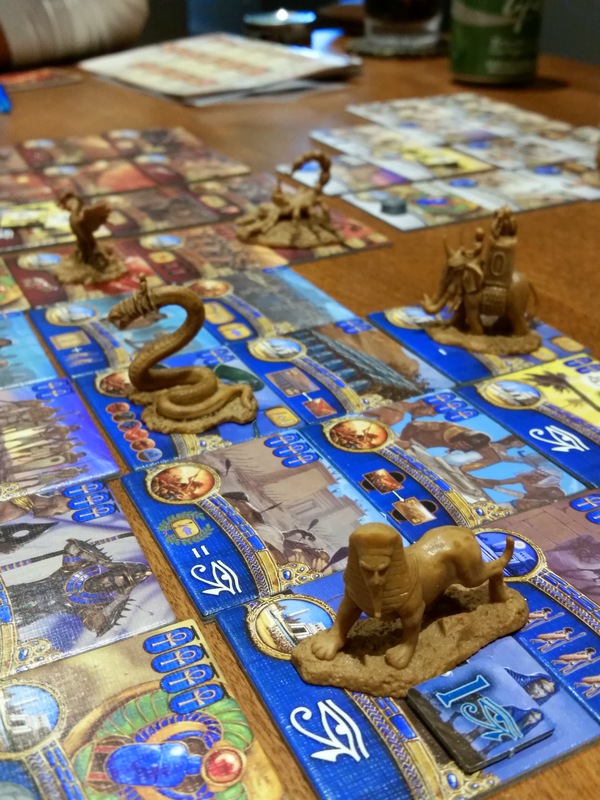 So Kemet is pretty fun, even though we gave Mutant: Year Zero a pass tonight. The setting is kind of a… mythical sci-fi Egypt. I say “sci-fi” because there’s a Stargate in the game. Oh yes. And giant elaborate “gods” and their crazy oversized monsters. 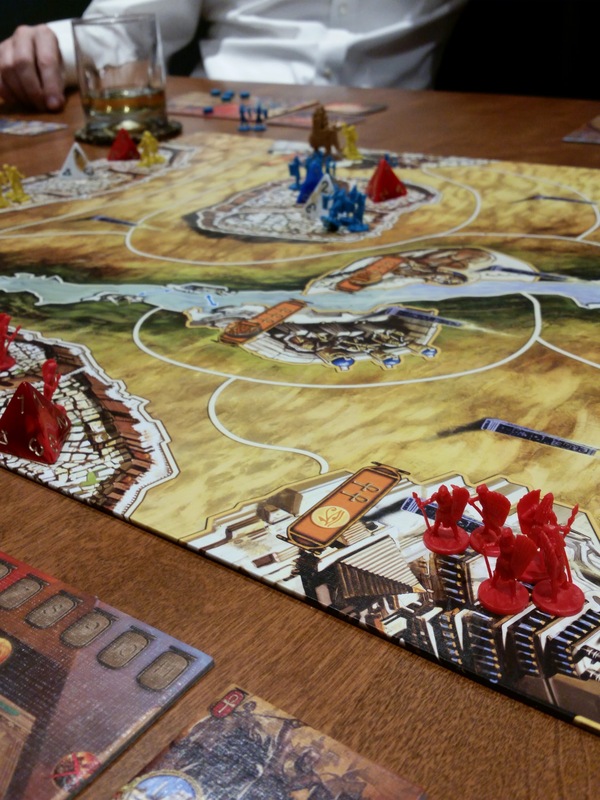 Kemet is a very lubricated armies-on-a-map victory point chase. Reminds me a lot of Chaos in the Old World. It’s nearly impossible to turtle into a winning position, and the game does everything in its power to get everyone attacking everyone else. We played two games tonight, one a 3p learning game, the second a more serious 5p game. Games run 2ish hours, which is just about perfect. The map is totally liquid. You can teleport from pyramids to obelisks all over the map (they are most notably in temples, which gives you a VP for holding them as long as you can hold them), you can buy these huge mythical creatures that give you big movement and fighting bonuses…basically everyone can nearly reach everywhere with a little effort. So you get permanent VPs for winning attacks, controlling multiple temples, feeding troops into this thing called the Sanctuary of All Gods, straight up buying them (no more than once), and by controlling the Sphinx. You’ll never lose those, which means attacking is awesome but also you kind of don’t want to leave troops sitting around in ones and twos waiting to get beat up. There are also temporary VPs for building and holding top-tier pyramids, and for holding temples. Those are very easy to lose. Probably the killer app of the game is the set of Powers you can buy. 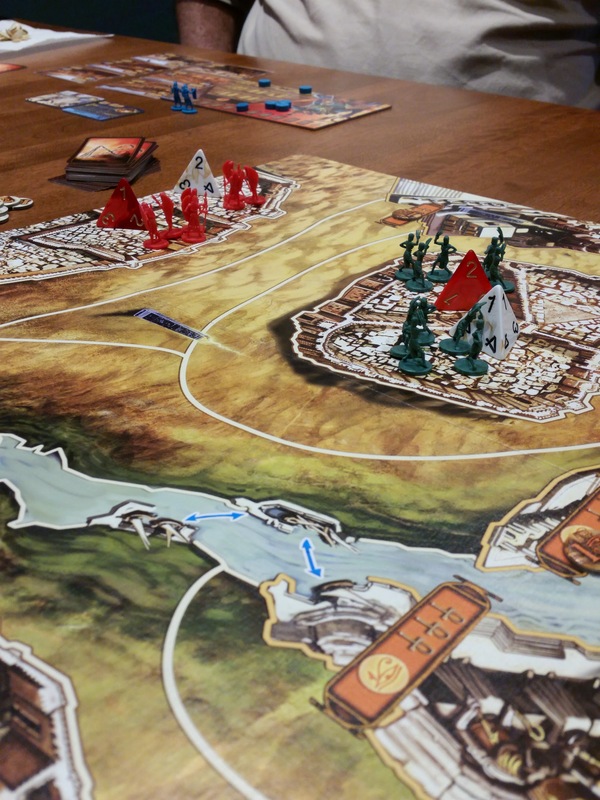 There are three colors (red, white, blue) that correspond to three pyramid colors on the map. They’re oversized d4s that you spin around to show what “level” they are, therefore what level of Power they can buy. Lots of synergies and combos and I love me some combos. The iconography is easy-ish to suss out, and it didn’t take long to figure out what they all did. There are also cards you draw that give little surprise bonuses, and use similar icons. I lost twice. When I’m deep into RPG mode, my killer instinct is so deeply suppressed that it’s really hard to rouse myself to really engage. 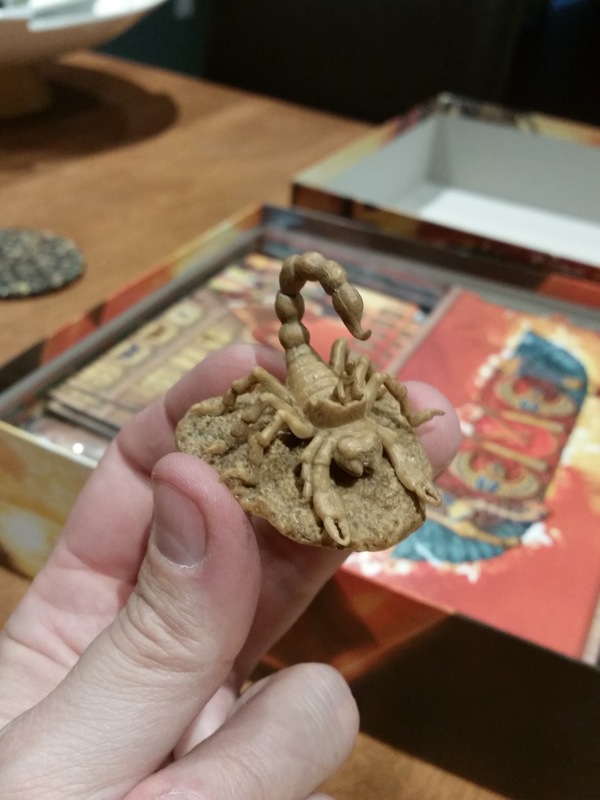 But it is tight and very well designed — terrible, terrible rulebook though! — and we’ll be playing it more in the future. 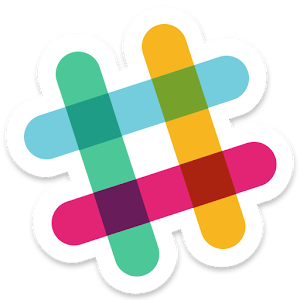 I hope you’re happy, Clint Shulenski​. Finally got here! And even though I read the pdf I had no idea what a slender volume it is. I can’t believe how much I’m spending on this game. Picked up more custom dice as well. This was my favorite board game last year, of a field comprised of lots of really good boardgames. Wallace is working on a new edition and wow does it look different. Different enough that it almost seems like a different game. I wonder if it will still have the loved/hated “lowest-scoring agent dqs her whole team” rule?